Skin cancer is the most common cancer in Ireland. Most cases are caused by UV rays from the sun. UV rays also cause skin ageing, sunspots and eye damage. According to Irish Cancer Society, one in four (23%) of skin cancer deaths in Ireland are from the Construction, Outdoor and Farming Industries. The Society warns that construction workers need to be extra vigilant during the summer months. This summer CIF is also urging all workers to protect their skin and reduce their risk of skin cancer. A recent report published in the ‘British Journal of Cancer’ said that construction workers diagnosed with melanoma skin cancer had the highest number of deaths (four in 10), followed by agriculture workers (over two in 10). Kevin O’Hagan, Cancer Prevention Manager with the Irish Cancer Society, said, “The figures from the CSO show that in 2014, we had around one death every week in Ireland that is related to sun exposure at work. Coupled with the research from the UK, it shows just how extensive, and unfortunately fatal, sun damage can be for outdoor workers. “It’s vital that we pay heed to this in Ireland this summer. You don’t have to work in a Mediterranean country for the sun to do damage to your skin and Irish people need to wise up to that. It would be really useful if workplaces whose employees work predominately outdoors did a risk assessment and put in place policy in relation to protection from sun exposure. 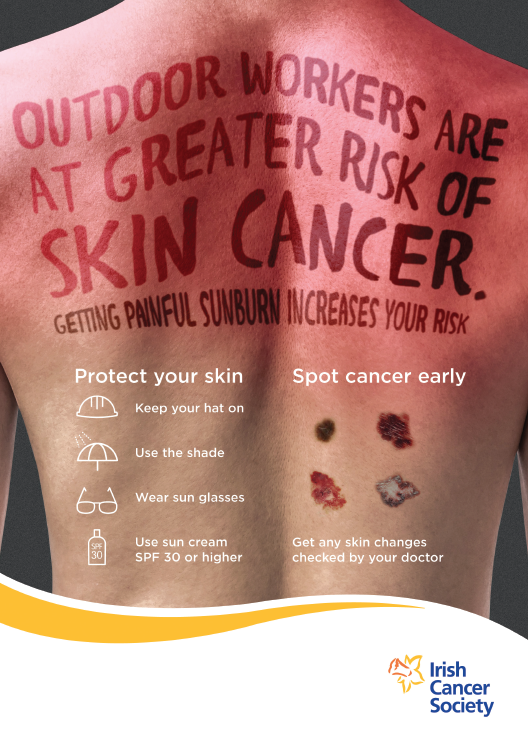 The Irish Cancer Society and the CIF have produced a leaflet and poster for members on how to be safe in the sun and how to reduce the risk of skin cancer.